Posted on September 25, 2015 at 7:06 pm. We grow 16 varieties of taxus, so we are sure to have one to fit your needs. 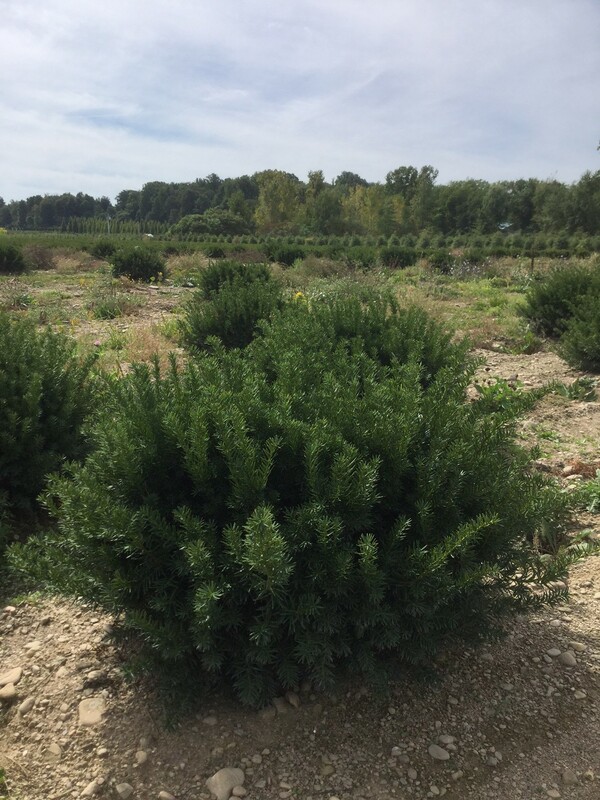 From cold hardy cuspidata, to tall and thin Adam’s perfect for hedges, to Densiformis, Wardii and Brownii for mass and foundation plantings. They are machine dug in a basket for an optimum package, yet no larger or heavier than a hand dug ball. 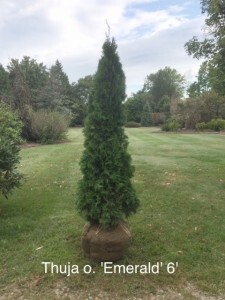 Posted on September 18, 2015 at 4:01 pm. 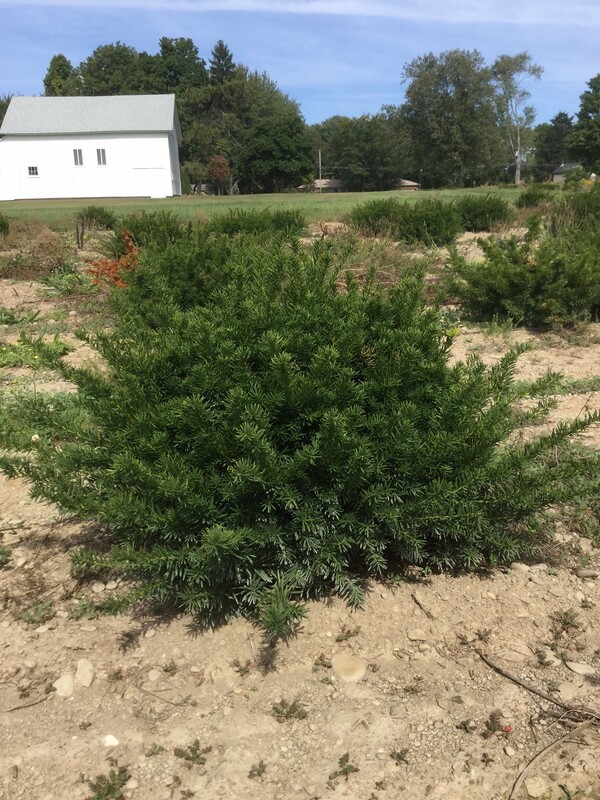 This is the time of the year when most plants are losing their visual impact. Grasses are coming into their own now adding interest and texture to a landscape. We have a great selection ranging in size from the compact Pennisetum a. ‘Little Bunny’ to the tall Erianthus ravennae. Posted on September 4, 2015 at 7:35 pm. We strive to grow plants that are of a superior quality that shine in any landscape. 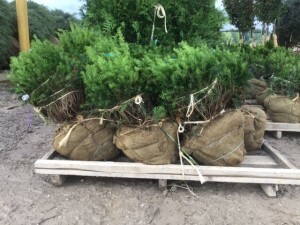 In an effort to ensure our high quality plants have solid root balls that hold up to handling and shipping, we put a machine ball and wire basket on many plants that are traditionally hand dug. Some examples are in the photos below. We believe you will agree that the extra effort and cost we put into the package pays off with your customer’s satisfaction. 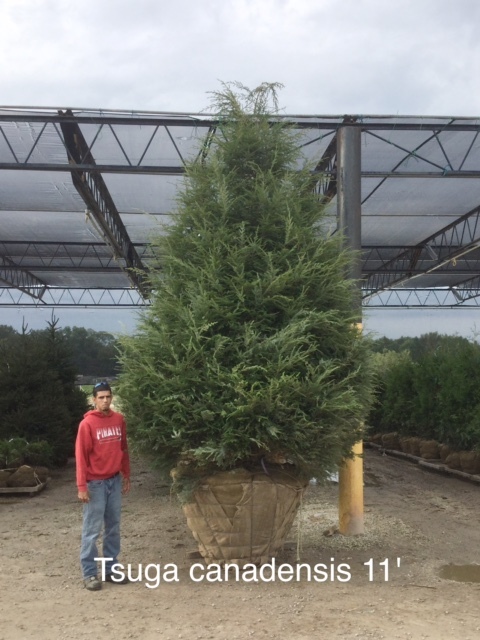 This 11’ Tsuga canadensis has the typical fullness, feather and shape of our 5’ to 12’ trees. 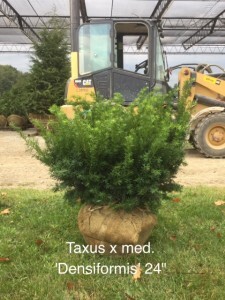 The wire basket consistently allows our Taxus to hold up very well in a holding yard and perform great when planted. 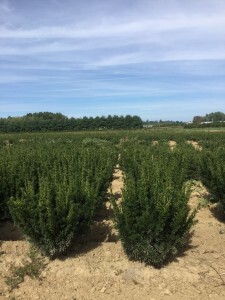 Our Emerald Green arborvitaes have plenty of width. They are in a 24” ball to give you an idea of the fullness of the plant which will require fewer plants in your hedge. These Hydrangea que. ‘Snow Queen’ in a #10 are field grown for two years before they are bare rooted and potted in early spring. You are getting field grown quality in a container that is second to none. Itea vir. ‘Saturnalia’ #10 will make an instant hedge. 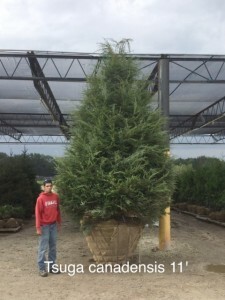 These plants have a mature height of 4’ and width of 5’. 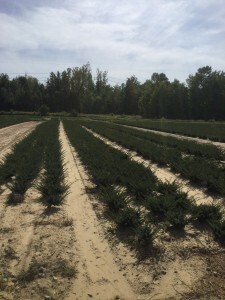 They can tolerate clay soils and wet conditions. When we dig material it is handled one time to load onto the pallet and once again when placed onto your truck. 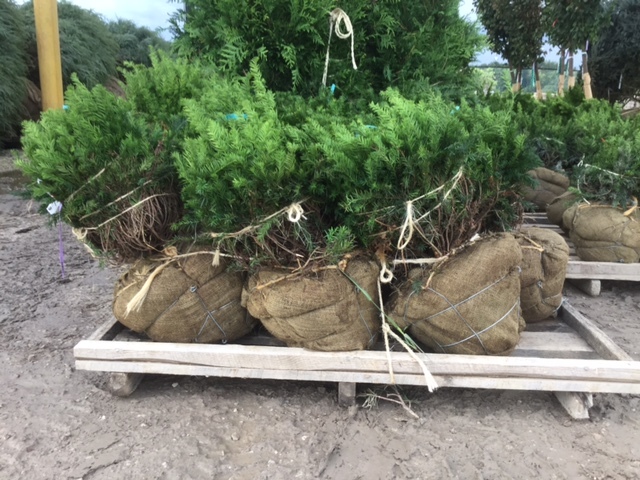 We move the plants around on pallets to hold the integrity of the ball. Rhododendrons have a small root system that can be damaged easily while handling. 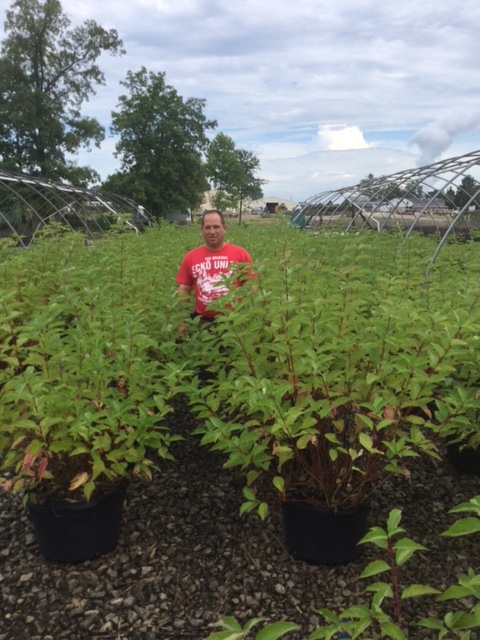 We put our larger Rhodies in baskets to increase your success. Cornus stol. 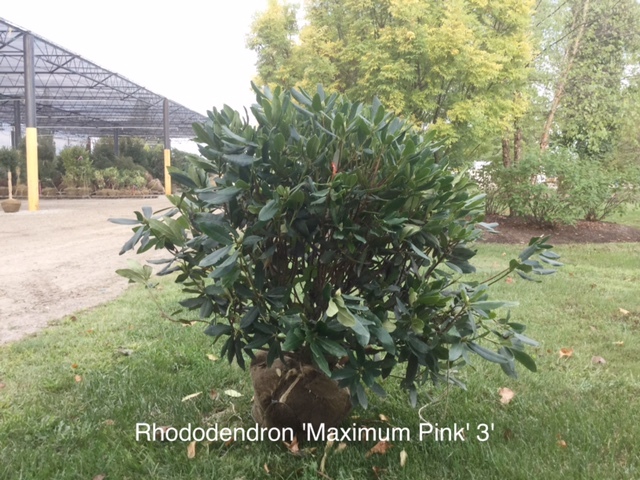 ‘Arctic Fire’ #10 have great winter color, hardy to zone 2 and is just one of the many Proven Winner selections we grow. Posted on September 4, 2015 at 6:45 pm.